STEM THEMES: Coding, Women in STEM. DESCRIPTION FROM THE PUBLISHER: Since 2012, the organization Girls Who Code has been leading the charge to get girls interested in technology and coding. Now its founder, Reshma Saujani, wants to inspire you to be a girl who codes! Bursting with dynamic artwork, down-to-earth explanations of coding principles, and real-life stories of girls and women working at places like Pixar and NASA, this graphically animated book shows what a huge role computer science plays in our lives and how much fun it can be. No matter your interest―sports, the arts, baking, student government, social justice―coding can help you do what you love and make your dreams come true. 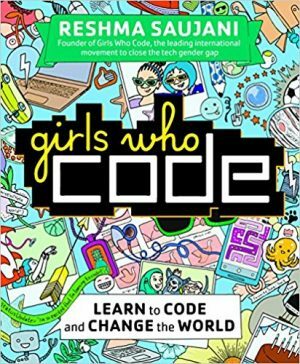 Whether you’re a girl who’s never coded before, a girl who codes, or a parent raising one, this entertaining book, printed in bold two-colour and featuring art on every page, will have you itching to create your own apps, games, and robots to make the world a better place.